Might want to look at the 990 returns of the charitable entity you work for. Non profits are rife with these princely payments because "this is what the market demands we pay for these talented people that are in such short supply." The last time I looked, the CEO at Northshore was clearing close to 1.5 mil for his great guidance (and willingness to battle the FTC every 10 years or so over monopolistic mergers and behavior.) Many organizations are skirting these tax exempt laws for profit going to a few well placed individuals. Another reason we have such economic equality in the US of A. "Why the IRS Needs to Investigate the ABIM". More importantly, why ISN'T the IRS investigating the ABIM? While we're at it, why do the federal courts drag their feet regarding litigation directed at the ABMS? And why did Congress pass the ACA which legitimized the ABMS gangsters? Federal complicity in all three branches is the common thread. The near total control of physicians and their practice behaviors have been outsourced to the private sector. We are now surveilled by EMR systems, and can look forward to life long exams that are shrouded in secrecy and can even introduce unvetted standards of practice (Choosing Wisely comes to mind). Our very careers are also being threatened. Only those who have nothing left to lose rebel. Physicians have too much to lose and will likely remain submissive for the foreseeable future. There may be a glimmer of MOC reform hopes at the State level, where competition may be heating up to retain physicians, as a shortage purportedly looms. This has already been witnessed in a handful of states. Rest assured, however, that the ABMS already has its beady eyes set on influencing the State Boards as well. Pay attention to Ohio. "Laws catch flies, but let hornets go free." We agree the IRS should take a look at the ABIM and other boards; they should be able to recover some money. Somebody could guide them through the process and get a recovery reward. It is ridiculous that ABIM and the others do not pay any tax. 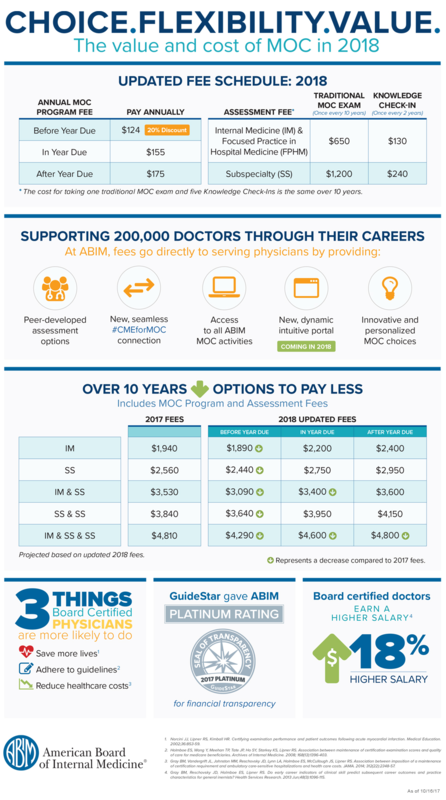 It's obvious to most physicians that the ABIM/ABMS are dodging taxes; crystal clear when this abusive business franchise has docs by the nose ring. Branded with the trademark MOC. It all hurts. Just look at all their business partners listed above ready to jump in the game like Wolter Kluwer, the UpTodate parent company. I don't see any of their for-profit partners mentioned on the tax forms, except the multi-million dollar payments to CeCity, the former ABIM CEO's acquisition target for Premier, Inc. The for-profit list of the ABIM partners is growing all the time. A great deal of money is flowing through the ABIM. Over a quarter of a billion $$$,$$$,$$$ in program related revenues every 4 years. And a whole lot more than that is changing hands between them and their partners. Docs are owned by the ABMS' Chicago MoC®antile Exchange. Docs are bought and sold in a neat tidy line with their tails pinned up high. Mandated to stand waiting for a buyer right next to the pork bellies. "Don't you try to run away in the land of the free, we need your MOCfees." ABIM hired this man, Chris Jennings and his firm in DC paying $120,000 in 2010. What for? ABIM says "no" to the question of lobbying on their tax forms. Why did ABIM hire this lobbyist in 2010? "Mr. Jennings, 52, was President Clinton’s chief health policy adviser from 1995 to January 2001. He is known and trusted by Obama administration officials and has close ties to Democrats and some Republicans in Congress. In 2001, he established a lobbying and consulting concern, Jennings Policy Strategies. Current and former clients include the A.F.L.-C.I.O., the Bipartisan Policy Center, the Federation of American Hospitals, General Motors and the Generic Pharmaceutical Association. Mr. Jennings was a registered lobbyist, but has not been one for a couple of years, so he would not have to worry about Obama administration restrictions on lobbyists joining the government." We need to rebel against the entire board certification process from the get go. As long as we allow them to tell us we can't practice without being "board certified" (which is a fancy way of saying that we played a memory game and answered some multiple choice questions on a test), they have us by the necks. There should be no requirement for any form of board certification period. Until that day happens, we will remain under the control of the ABMS. Getting rid of MOC only fixes a tiny portion of the problem.